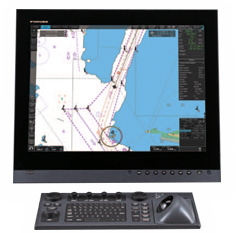 Navigation sensors can be directly interfaced with the ECDIS processor’s 8 serial I/O ports. In order to integrate onboard sensors into the navigation network, the sensor adapter may be interfaced with the switching hub HUB100, from which distribution of the sensor data throughout the network is possible. Alternatively, multiple sensor adapters may be interfaced via Ethernet to integrate onboard sensors for use in the shipboard network. The FMD3200 can interface with existing FAR21x7/FAR28x7 series Radar for Radar overlay, target track info, route and waypoint exchange via Ethernet. The FMD3200 utilizes cutting edge chart-drawing engine that delivers instantaneous chart redraw with seamless zooming and panning, making operation stress-free. Moreover, its operation philosophy is based upon the same familiar logic as the control scheme of a PC mouse, and all operations can be controlled with the use of trackball of the control unit by means of left-clicking, right-clicking and using a thumbwheel. A full QWERTY style keyboard is available in the ECDIS control unit for easy route, event and waypoint naming. The FMD3200 provides the operator with quick access to the tasks and functions to be performed in the midst of vessel operation. This new ECDIS employs two new, intelligently arranged Graphic User Interface elements: Status Bar and InstantAccess Bar, that deliver task-based operation scheme to give the operator direct access to necessary operational procedure. The Status Bar at the top of the screen provides operating status, including modes of operation and presentation. The InstantAccess Bar on the left edge of the screen provides quick access to functions available in each of the ECDIS operating modes. The contents of the InstantAccess Bar change according to the operating modes selected on the Status Bar. This combination of the Status Bar and InstantAccess Bar covers virtually the entire operation, providing the operator with quick and easy access to the tasks to be performed. Subsequently, the need for delving into intricate menu trees to reach necessary tasks has become a thing of the past. The FMD3200 has streamlined the navigation monitoring procedure, reducing the risk of confusion and erroneous operation as well as enhancing situation awareness.